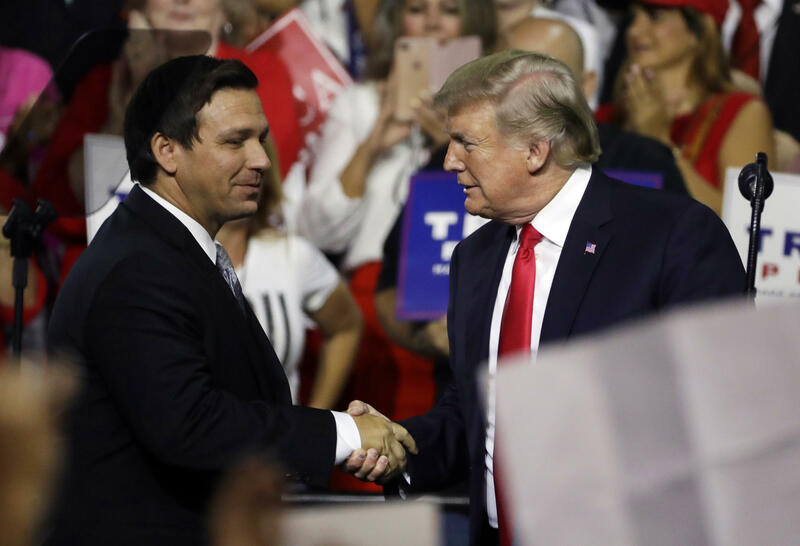 In this July 31, 2018, file photo, President Donald Trump (right) shakes hands with Florida Republican gubernatorial candidate Ron DeSantis during a rally in Tampa, Fla.
DeSantis was first elected to Congress in 2012, running as a Washington outsider. His television ads were Trump-focused, including one where his toddler stacks bricks while DeSantis exclaims, "Build the wall!" The strategy worked, and many voters say that's what convinced them to support DeSantis. "I changed my vote when Trump supported DeSantis," said the 67-year-old retiree from Pinellas County. "I also loved his commercial, the one with the kids." Josie Parke, 68, an interior designer in Coral Gables, said Trump's backing swayed her vote for DeSantis, too. "I believe in Trump's policies and while I don't love the way he opens his mouth too much, sometimes saying things that are not quite appropriate, I do believe that in his heart he really means well. He's doing things the way I like," Parke said. 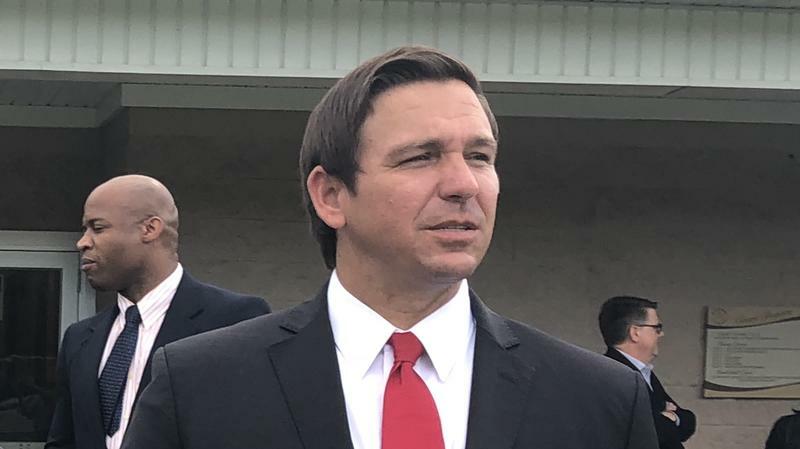 DeSantis entered the race a month after Trump's December tweeted that he would make "a GREAT governor." Later Trump held a rally for him in Tampa. Suddenly, he was considered the favorite over Putnam, who raised more money, campaigned longer, built support among the party establishment and ran a traditional grassroots campaign. Supporters at DeSantis' party in Orlando chanted "Ron! Ron! Ron!" when he was declared the GOP nominee Tuesday evening. Putnam was elected to the state House in 1996, to the U.S. House in 2000 and to his current job in 2010. He had become one of the most powerful Republicans in Congress before deciding to run for agriculture commissioner. DeSantis will now face the Democratic nominee to replace Republican Gov. Rick Scott, who can't run for re-election because of term limits and is instead challenging Democratic U.S. Sen. Bill Nelson. Scott had an easy win in Tuesday's GOP primary, and now he heads into an increasingly bitter — and expensive — showdown with Nelson that could play a decisive role in which party controls the Senate. 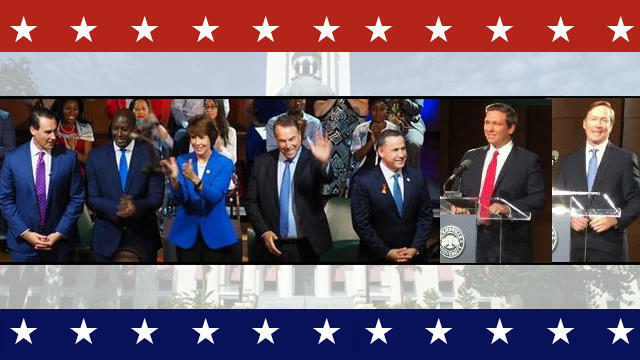 Facing off in the Democratic gubernatorial primary were former U.S. Rep. Gwen Graham, former Miami Beach Mayor Philip Levine, billionaire Jeff Greene, Tallahassee Mayor Andrew Gillum and Orlando-area businessman Chris King.